Forget about Olympic gold. Everyone’s going for green these days. Vegetarianism has grown in popularity in recent years, aided, in part, by a huge celebrity following, as this video demonstrates (apologies for the naff music). Everyone from Buddha to The Beatles ditched meat and opted for fruit and veg instead. Some celebrities became very active in promoting vegetarianism (have you downloaded Paul McCartney’s Meat Free Monday song yet?). Celebrities become vegetarians for different reasons: a young Christian Bale read Charlotte's Web and since then has said no to a platter of pork and all things with a face. Gwyneth Paltrow opted for vegetarianism for a healthier lifestyle (it does add to her alternative health and yoga-loving lifestyle doesn’t it). Morrissey refused to play a gig because he was appalled by the smell from a nearby barbecue. I am a meat eater. I tried to give it up in my teens. I failed after three days when it dawned on me that if I opted for this lifestyle I would never be able to order a 1/4 duck with crispy pancakes. However, I have decided to make my Mondays meat free and as I live and work in London I’ve hunted around for the best veggie restaurants. I’ve discovered a lot of them have a celebrity cult following. Well, if it’s good enough for the media mob it’s good enough for me. My personal favourite vegetarian restaurant in London (pictured above) happens to be a regular haunt for the Regent Street rich and famished famous. It’s low lit but the interior is still bright and vibrant on account of the large windows. With the philosophy of using fresh seasonal ingredients of the highest quality so the food you love actually loves you back, Tibits will help all those eating there to feel virtuous. Perhaps this is why the likes of Frank Skinner, Uri Geller, Ellen Page and Dame Kelly Holmes have been spotted there. The restaurant’s buffet boat has 40 dishes to choose from ranging from quinoa salads, falafel to vegetable quiches and risotto. The quirky twist is how to pay. The food is sold by weight and priced accordingly. My guest and I enjoyed everything about Tibits, from the warm staff, to the pleasant atmosphere and flavoursome food. No celeb spotting on that occasion but Made in Chelsea’s Mark Francis was lounging in the evening sun just round the corner. 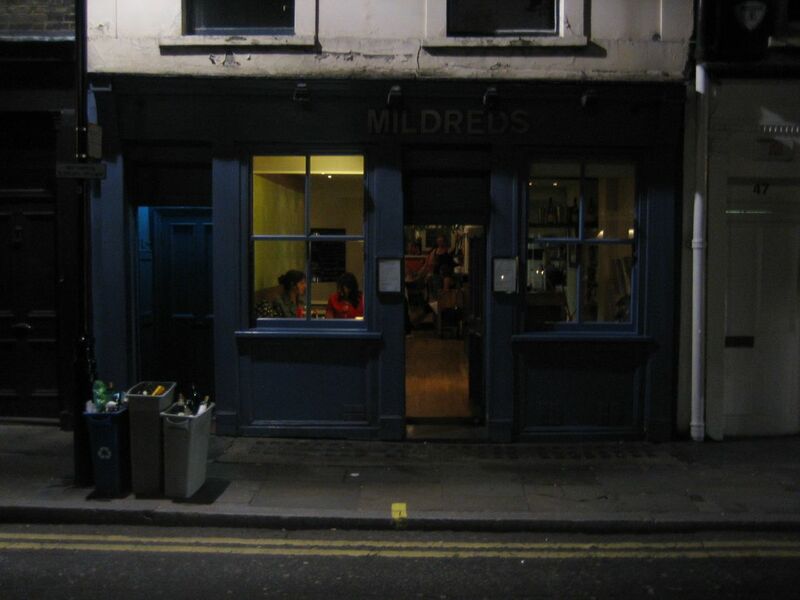 This eclectic and homely restaurant (pictured above) is on the same street as Lucy in Disguise – the clothing shop owned by Mrs Lily Cooper – aka TAFKALA – aka The Artist Formerly Known As Lily Allen. It’s possible that the former singer and her celeb clientele have popped in for a lunch break. Chances are if you grab a window seat you’ll definitely spot a star or two milling about after a shopping trip on Carnaby Street, magazine shoot at Hearst publications or interview at Absolute Radio. Inventive, affordable, and popular with both omnivores and carnivores alike - everyone balks at first at the idea of a risotto cake but ends up ordering it on every visit. The only snag is it has a no booking policy and queues are inevitable, so chat to a celebrity whilst you wait! This cupboard-sized restaurant is an institution among the London vegetarian dining world. It first opened its doors in 1974 and, unlike other vegetarian restaurants in London, has no intention of closing down! It’s mere minutes away from the dance, theatre and creative communities: nearby neighbours include Pineapple Dance Studios, the Royal Opera House and the Hospital Club (a members-only club for those in the arts and media industries and where the beautiful people hang out). The menu is like the restaurant: small but eclectic, with a variety of dishes from Spanish lentils to homemade quiches. It’s hearty and filling fare that’s exceptionally priced; £4.90 for their Thai curry and you’ll still get change from a fiver to give to one of those street performers (I’ve always had a soft spot for the mime artists). The seating can get a little cramped due to the itsy bitsy premises so you may often have to share tables. It all adds to the cosy feel and I’m sure there’d be no complaints if you were sat next to Pineapple’s Andrew Stone or Hospital Club member Jude law if they ever happened to pop in for a quick veggie bite, which I’m sure they must have done at some point. Image courtesy of Flickr user jeckman and stusmith_UK.